2014 saw the hundredth anniversary of the start of World War One and this caused a rekindling of interest in the long, bloody fighting line that straddled Europe between 1914 to 1917. To mark the occasion the 2014 Tour de France visited many of the major battlefields and stage five began at the Belgian town of Ypres. Inspired we set off to visit Ypres with the aim of Riding the fearsome Kemmelberg. It was at Ypres where the British and the Commonwealth armies fought many of their bloodiest battles. The old fortress town of Ypres situated in the north of Belgium became a salient that pointed a finger into the German front lines. To the north is Passchendaele and to the south is the Somme and thereafter the line runs through France via Arras to the French fighting pivot point of Verdun, to the south of Paris. Each spot is now synonymous with the horrors of war. Verdun is also a major remembrance point and was visited by the 2014 Tour on stage seven. The Ypres salient was a major challenge to German military planners as it stood in defence of the potentially war winning capture of the ports of Calais and Dunkirk, especially as Antwerp and Ostend fell into German hands. Thus they attempted to outflank and encircle the salient, whilst the British and Commonwealth armies fought not just to hold the line, but also to widen their foothold. 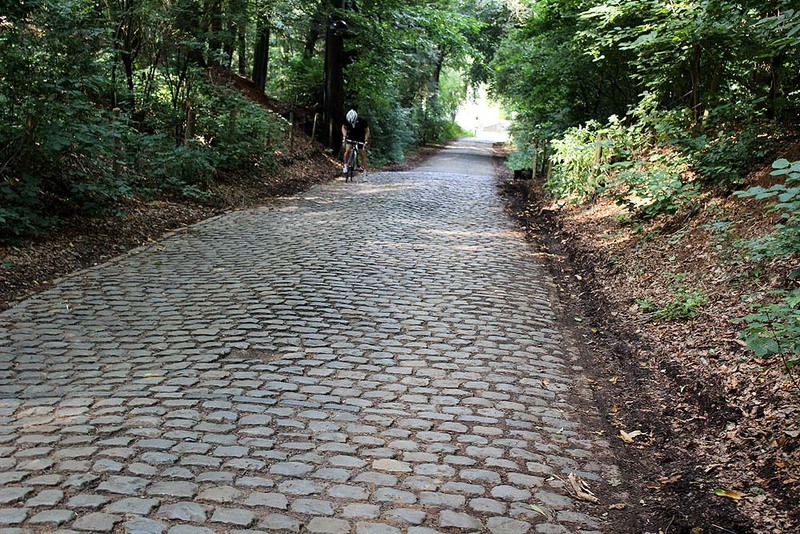 For cyclists Belgium is an ‘open door’ and one of the great climbs of cycle sport is the Kemmelberg, a fearsome cobbled ascent which is situated just a few kilometres south west of Ypres, which is where we headed in August 2013. The huge popularity of the Koksijde World Cup CycloCross, close to Dunkirk, and the Ghent Six Day track meeting with British cycling fans is a clear indication that Belgium is an accessible option for a cycling trip whether for a day or a long weekend. We chose to visit Ypres because of the Kemmelberg and to check out an area of Flanders that has such a strong a link to Britain. We drove to the Eurotunnel at Dover and caught an early train meaning that the 92 kilometres drive from Calais to Ypres would see us in the centre of town well before lunch. The day cost us below £100 and if you get four people and kit into a car then it becomes even cheaper. Eurotunnel offers value and convenience, but if you have more time the ferry companies have some good deals. Ypres is basically a ‘new’ town, having been reduced to rubble by the war and the remarkable ‘Cloth Hall'(Lakenhalle) stands proudly in the town square. There are two historic exit and entry points into Ypres; to the East is the famous Menin Gate with its arch inscribed with the names of tens of thousands who have no known grave and to the south, the Lille gate (named after the city held by the Germans in WW1). Both cross the Kasteelgracht and Majoorgracht moats surrounding the fortress. At the Lille gate and buried with so many within the town’s earthworks are a row of graves that includes Fijian engineers and this reminded us how varied the allied army was. 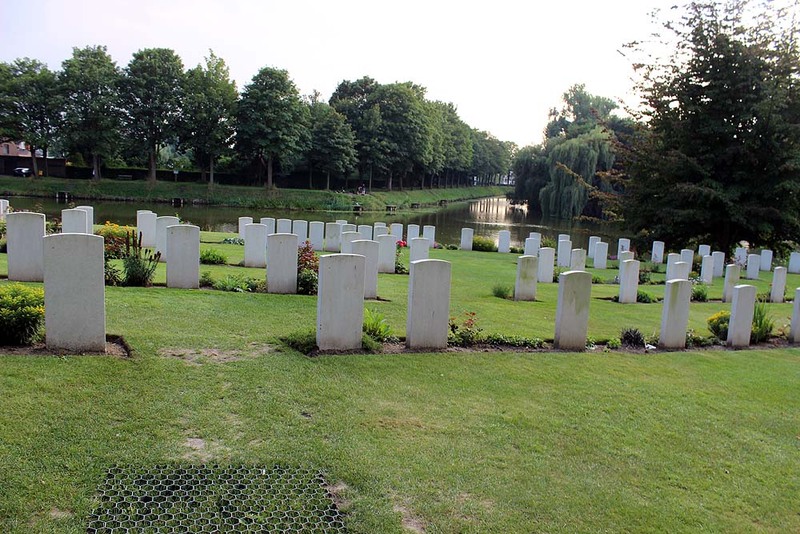 We chose to head out over the Ypres cobbles via the Lille gate (N336) across the Gracht Bridge, which the Fijians had died keeping open, and set our sights on riding out and over the Kemmelberg. Finding your way in Belgium is pretty straight forward, you can work out your general direction of travel and then follow the many signed cycle routes or do what we did, and buy a specific cycle route map from the ‘In Flanders Field’ Museum based in the Cloth Hall; we used it in combination with the marked routes. The route we took out to the Kemmelberg wasn’t the best and with hindsight we could have taken more care to follow the suggested ‘nicer’ way. As it was, we soon reached the local roads leading to the Village of Kemmel and we said farewell to the cycle path that separated us from the speeding trucks. Situated to the south of the town, the Kemmelberg commands the high ground between Armentières and Ypres, just behind the Messine Ridge. In 1914 the Allied Armies of Britain, Commonwealth, Belgium and Portugal (the German’s having declared war on the Iberian nation because of their pro-Allied stance on neutral shipping), were able to hold onto Ypres, the Messine Ridge, the Kemmelberg and close by the Scherpenberg. In early 1918 the Messine Ridge and Kemmelberg were key objectives for the German Army. The allied soldiers at the Kemmelberg were set squarely against their counterparts of the Central Powers (Germany, Austro-Hungarian Empire and the Ottoman Empire). After many years of fighting over a few metres, in April 1918 the situation abruptly changed when the German army attacked (Battle of the Lys) and caught the undermanned and under-resourced Portuguese defenders off-guard as they were about to be relieved by French soldiers. Despite some stiff resistance by the Portuguese and British defenders they were overwhelmed, and even the dispatching of reserves, including the British 11th Cyclist Battalion, could not stem the German advance. The Kemmelberg, Scherpenberg, Messine Village and Ridge and much of the strategic ground was now in German hands and the allies were on the brink of defeat. 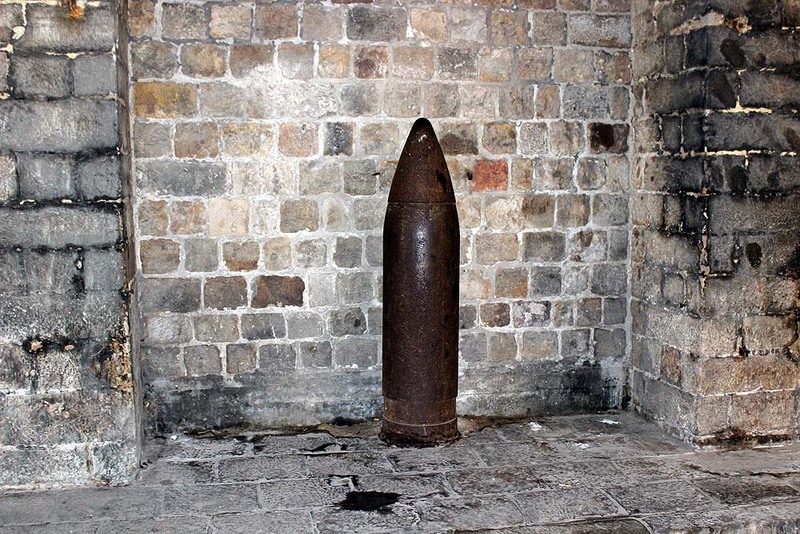 But Ypres was held and this failure by the German’s to take the town was vitally important to the allies. 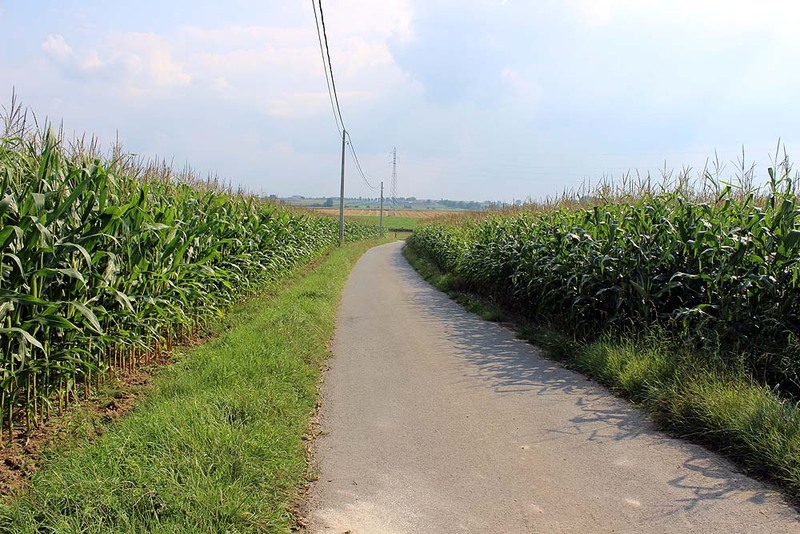 As you pedal through the area you can see very obvious signs of the carnage that befell these Belgian hills and fields. The roads leading to it are lined with monuments to countries from across the World (Australian and New Zealand troops being very numerous), including small and large military cemeteries. 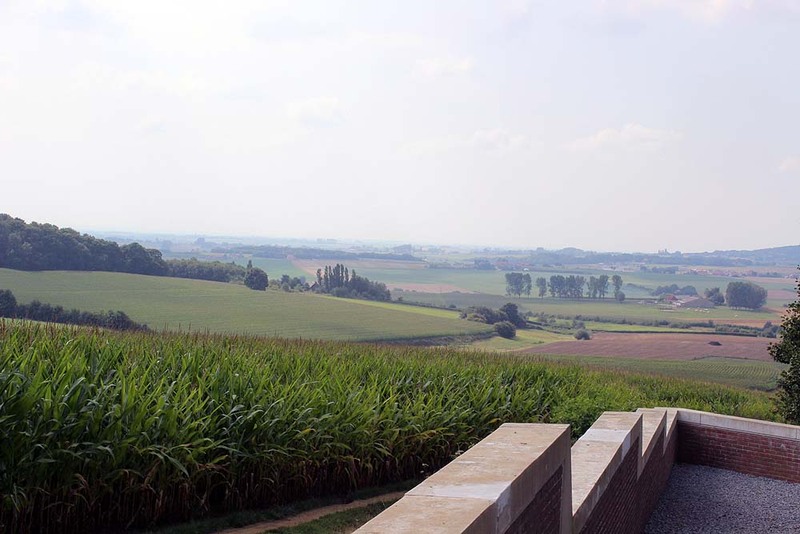 The Ossuary on the south side of the Kemmelberg contains the bones of French soldiers and it is here where you can find the best views toward Ypres. Best known to cyclist’s for its role in the Gent Wevelgem pro-cycle race the Kemmelberg is mostly approached from Messine with a sharp left turn onto the climb. However, having ridden through Kemmel Village we left the tarmac and turned right onto the cobbles. At this point any thoughts of wars or legend count for nought as the climb begins almost at once with no real chance to prepare. If you spend too much time thinking or looking for a smoother ride you lose pedalling revs, and then you really have to battle to recover. The best tactic is to hit it hard and take it as it comes; and only begin to adjust your path once you are well onto the pave. The pave itself is pretty uneven and really batters your wheels. We suggest that you follow the general rule of pave riding: that is to keep your momentum up, so don’t waste energy dodging about looking for an easier ride. 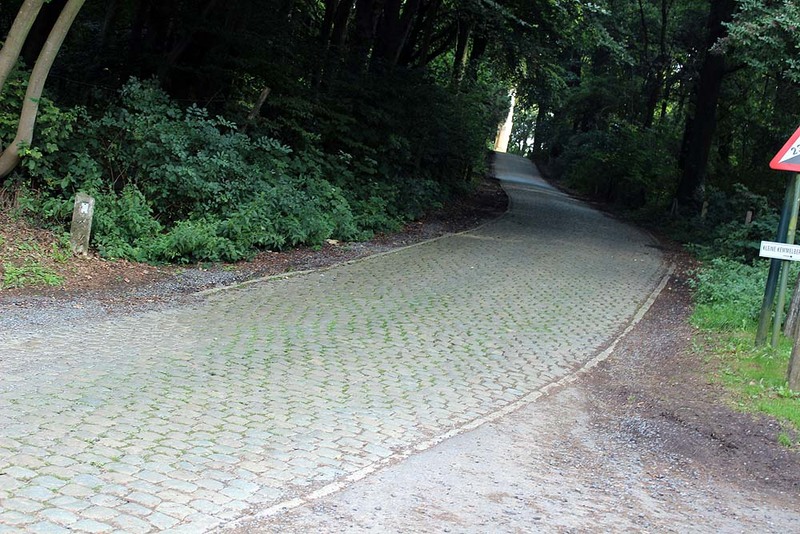 The hardest section of the Kemelberg is as it curves to the left and this is where the gradient bites. Although you may think that the curve allows you some respite, you’re mistaken; it merely sends you off line into the kerb stones, this ill prepares you for the final sting – the fight to crest the ascent. If you are going to put a foot down it will be here. I was once on the Kemmelberg in winter rain and in fading light, when a father and his two sons were riding up towards us – we had just discovered that yet again the Kemmel Cafe was closed (is it ever open?). The smallest of the three (maybe 11 years old) followed and as he hit this curve his rear wheel slipped bringing him to a halt. Did he get back on and ride the rest? No. He went down to the bottom and rode the whole climb again! Atop the climb the pave turns to tarmac and takes you past a NATO bunker, part of which is also situated further down the wooded slopes and which was once a prime air defence control centre, now open to the public. You also pass a posh, out of place looking hotel and at the end of the ridge is the massive monument to fallen French soldiers. 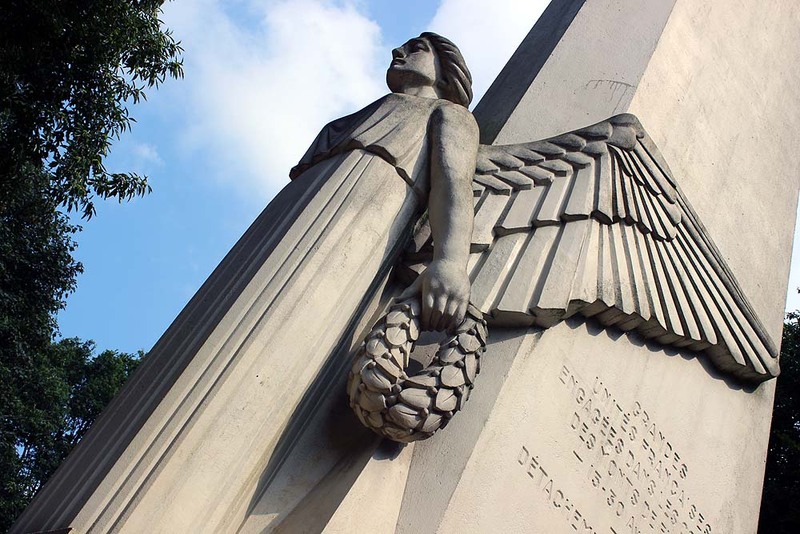 This monument offers a great resting point and a chance for reflection. 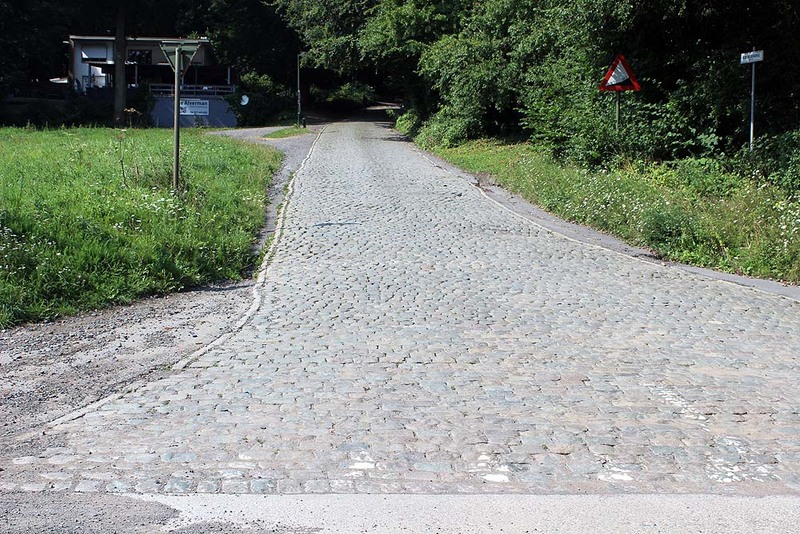 Until recently the Gent Wevelgem cycle race plunged down the 23-25% gradient of the cobbled descent. When you approach, it feels like you are about to jump off the edge of the world. We challenge anyone not to be scared on this descent and to cut your speed suddenly (a major cause of crashes). A visit to the French Ossuary to the left is a good enough reason to stop as any. In 2007 Jimmy Casper fell triggering a major and serious crash, and since then the race has avoided the descent and now follows a tarmacked, slim winding path to the bottom. The tree lined rolling climbs near the Kemmelberg soon give way to open twisting farm roads bordered by burgeoning crops and it was below the fearsome Kemmel descent, which some local races go up by the way, that we found the best roads of our ride. The roads to the Village of Messine and the Messine Ridge saw us curve leftwards, following cycle signs that pointed us back toward Ypres. Like the Kemmelberg, the Messine Ridge was a major battle site of World War One and was retaken by the Allies, along with the Kemelberg, in late September 1918. Some of biggest non-nuclear explosions on earth were experienced here, caused by the mines at Kruisstraat, Spanbroekmolen Maedelstede and at Petit Bois. Another vast mine crater is at Hollandscheschuur. Not wanting to ignore the history that surrounded us and wanting to stay true to the map and cycle way markers, we rode with a degree of restraint. We remarked to ourselves when a group of locals tore past us, that these roads must be truly awesome to ride at speed knowing how the roads flowed and what to expect around the next turn, a true kindergarten for Belgian pro-riders. Days later my riding partner Patrick mentioned the same to Surrey Road Race League founder Keith Butler and he confirmed that when he was a professional rider based in Belgium he was part of many a chaingang that trained on these roads. We rode at harvest time (late August) and the roads were caked in mud, which in conjunction with the pot marked tarmac, helps keep you very alert, being able to ‘bunny hop’ an abyss being a major skill of a pro-rider. Thankfully for us it was dry but if wet, extra caution must be exercised. We suffered only one puncture during the day and we fixed it in the shadow of a memorial to the New Zealand Army. It is in the ‘flat lands’ between the Messine Ridge and Ypres where military cemeteries come thick and fast. No matter the time of year the uniformed white tomb stones shine in the beautifully maintained gardens and we simply had to stop at a number of them. 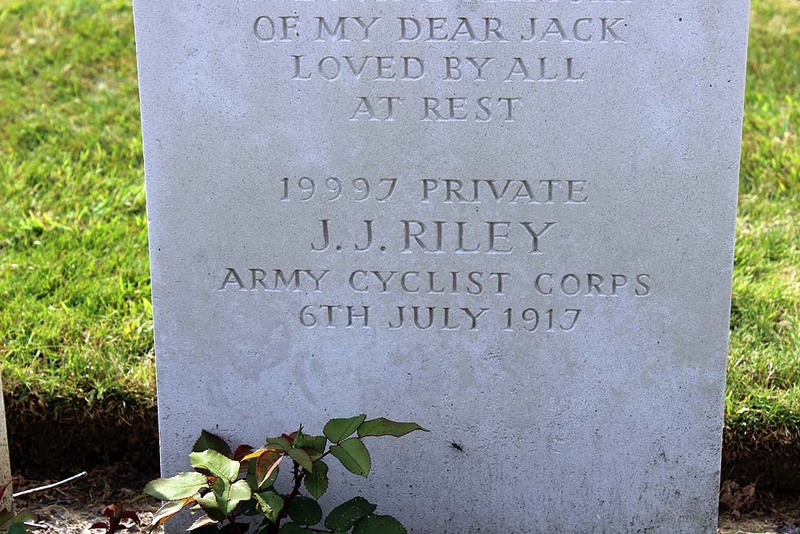 In one we found the grave of ‘Army Cyclist’ JJ Riley who died in 1917 and he shares a resting spot with J. Johnson of the London Regiment; we wouldn’t have missed standing by this grave for the world. Another notable memorial stone marks the spot where the Indian Army disembarked from lorries for the front line in 1914. The names of so many of those Indian troops are now engraved in long lists upon the Menin Gate. We sped back to Ypres and raced through the Lille Gate and to the Cloth Hall. We had taken our time and the ride had taken over four hours to cover almost 47 kilometres. Talking later as we walked the town walls, we agreed just how cool it would be to do it again, at speed. 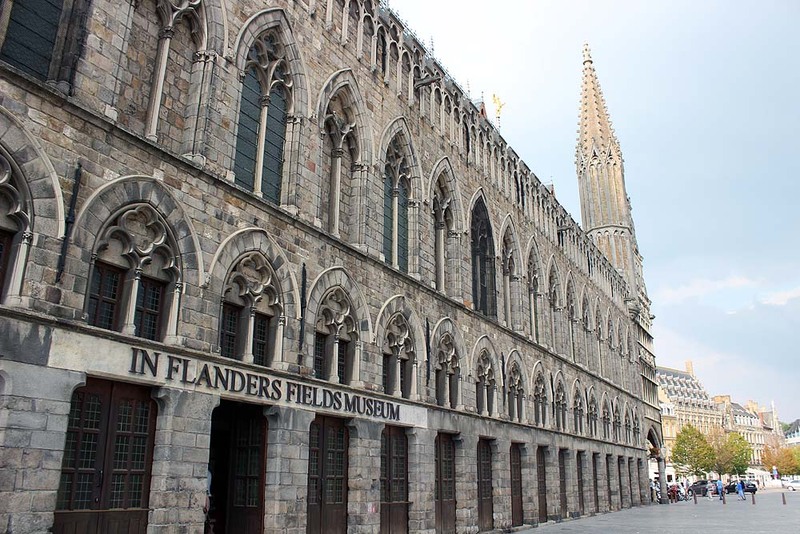 Ypres is firmly associated with the Allied Armies and English is widely spoken. There are many hotels and restaurants. As we have mentioned the Belgians are cycle aware and that makes spending a day or more in Belgium a real joy (if at times melancholic).